Fire up the grill for this easy grilled flank steak with garlic lime marinade. Incredibly flavorful and topped with a Mexican corn salad that is healthy and made with fresh avocado and bell peppers. Melt in your mouth delicious! This is a sponsored post written by me on behalf of We Love Fire. Spring has sprung and it’s time to brush the dust off those grills. I love using my grill for so many reasons. For one, I don’t heat up the entire house while cooking and two, grilling is less mess. And the flavor. Grilling meat produces some of the most flavorful and satisfying meals. Especially when it comes to grilling steak. 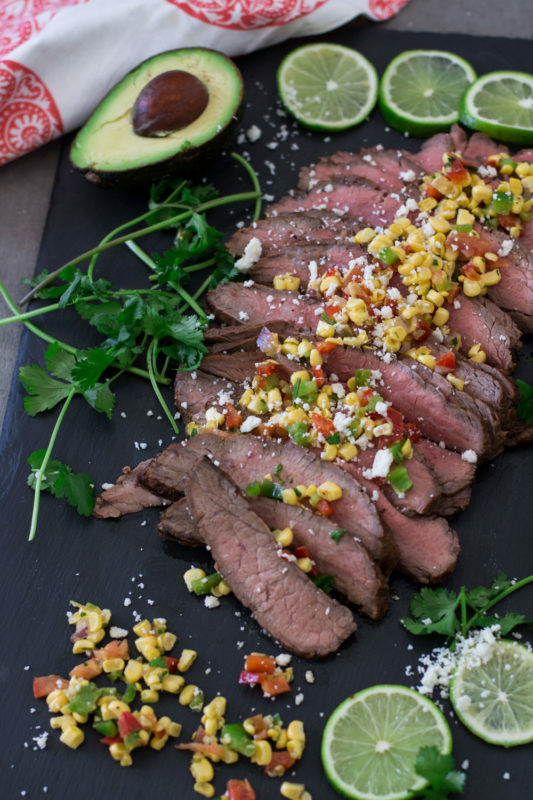 If you’re looking for new grilling recipes this spring and summer, you’re going to love this recipe for Grilled Flank Steak with Mexican Corn Salad. But first…let’s talk about grilling. Regardless of the type of grill you buy, this grilled flank steak recipe is guaranteed to taste amazing on any grill! Combine all the ingredients for the marinade. Make sure you chop the cilantro and slice the onions. Place the flank steak in gallon Ziplock bag and let it marinate for at least 3 hours before grilling. Just before placing the steak on the grill, you’ll want to make your corn salad. Chop the red and green peppers, dice the tomato and red onion and combine all the ingredients into a large bowl. Stir well and store covered in the refrigerator until the steak is ready. Once your steak has finished marinating, start your grill. I recommend getting your grill to an internal heat of about 400 degrees or higher. Remove the steak from the marinade and place it on the grill. I took a picture of the steak right out of the bag so that you can see how amazing this marinade looks. This flank steak marinade is FULL of flavor! To grill your flank steak, I typically grill it for 7-8 minutes on each side to get more of a medium doneness. If you’re going for more of a medium rare, grill for 5-6 minutes on each side. Once the steak has reached the internal desired doneness, pull the steak off the grill and let it rest on a plate for about 10 minutes. From there, grab a sharp knife and slice your steak into thin slices. 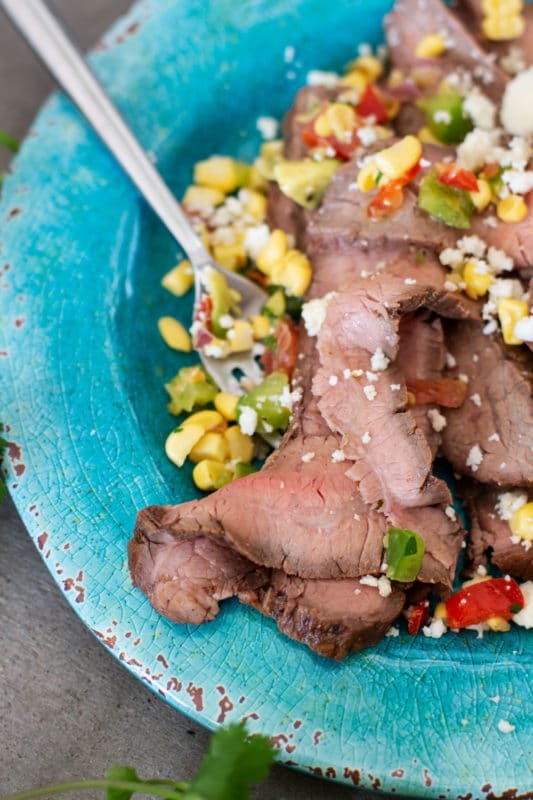 Grab that bowl of Mexican Corn Salad out of the fridge and spoon across the steak. Squeeze fresh lime juice on top of your steak and top with crumbled Cotija cheese. I mentioned above that you should marinate the steak for a minimum of 3 hours, but I highly recommend marinating this steak overnight. The longer the marinade process, the more flavorful. You can use different cuts of steak for this recipe such as flat iron steak or skirt steak. Letting your steak rest after pulling it off the grill is important to ensure the steak maintains all that juiciness. When cutting the steak, cut against the grain and cut thin slices. That helps ensure that you steak will be tender. I use raw corn on the cob when making the corn salad. I rinse the corn and start slicing the corn off into the bowl. Using raw corn is totally ok and so sweet and tasty! Skip the bottled lime juice and jarred minced garlic. Using fresh ingredients will provide the best flavor. And did I mention that this recipe is gluten free? 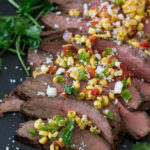 What Can I Serve With Grilled Flank Steak with Mexican Corn Salad? My Slow Cooker Herb Roasted Garlic Potatoes go perfectly with this steak. If you are a lover of garlic, you’ll love how these pair with the steak. Mashed Potatoes also complement a steak extremely well! Going for more of a low carb meal, serve this steak with my Grilled Green Beans. You already have the grill going so why not make your entire meal off the grill? I don’t know about you, but I love a versatile recipe. And I’m loving what I can do with this one! You have the option to keep it fancy and serve this steak with side dishes or dice up the flank steak and make tacos! I’ve also served this recipe as an appetizer. Regardless what type of grill you end up using and how you decide to serve it, this is easily going to become one of your favorite meals. 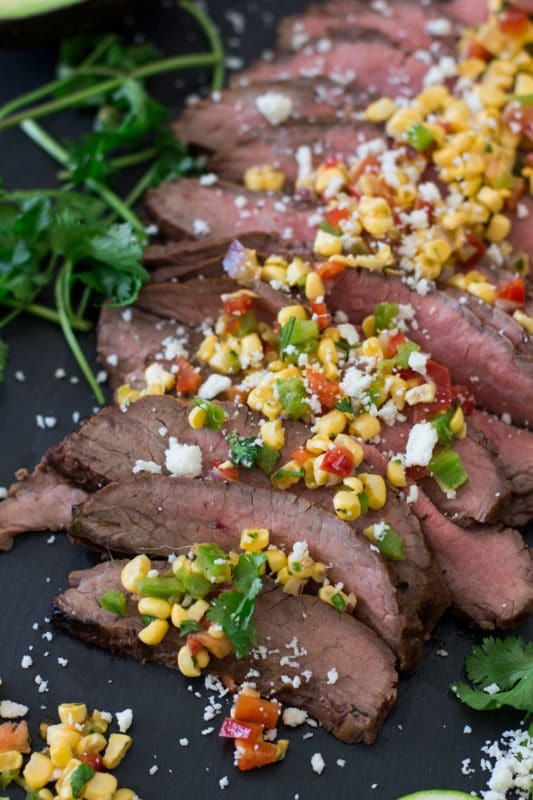 If you loved this Grilled Flank Steak with Mexican Corn Salad, give this recipe a star review! Also, snap a picture of your finished dish and share it with me on Instagram using the hashtag #recipesworthrepeating and tagging me @recipesworthrepeating. Chop the red and green peppers, dice the tomato and red onion and combine all the ingredients into a large bowl. Stir well and store covered in the refrigerator until the steak is ready. Combine all the marinade ingredients in a bowl and mix well. Please the flank steak and marinade in a large Ziplock baggie and place in the refrigerator to marinate for a minimum of 3 hours, but preferably overnight. Once the steak has finished marinating, start the grill and let it heat until it reaches a temperature of at least 400 degrees. To grill your flank steak, I typically grill it for 6-7 minutes on each side to get more of a medium doneness. If you're going for more of a medium rare, grill for 5-6 minutes on each side. Once the steak has reached the internal desired doneness, pull the steak off the grill and let it rest on a plate for about 10 minutes. From there, grab a sharp knife and slice your steak against the grain into thin slices. Spoon the Mexican Corn Salad across the steak. Squeeze fresh lime juice on top of your steak and top with crumbled Cotija cheese. 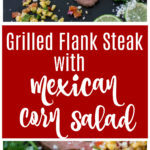 Flank steak is such a quick cooking and inexpensive steak and I absolutely love you you have dressed it with this corn salad! Yummy all the way! This recipe is also really good with flat iron steak! That marinade sounds fantastic. Meat is perfect and that corn salsa is amazing too. I must give this recipe a try. Very soon. It made me drool already. I hosting a taco party night soon and def wanna add this dish to the menu! The corn steak combo sounds dreamy and your pics are mouthwateringly stunning ~ yum! Hi Daniela! Let me know how the party turns out and what everyone thinks of the recipe! !